Little did I know he was taking me Restaurant Andre, currently ranking 3rd on Asia’s Top 50 and recently been awarded 2 Michelin stars. The understated entrance had a cosy glow; I felt I chose the right dress. Our server greeted us before introducing us to Chef Andre's unique octaphilosophy concept, explaining that the meal had a focus on fresh seafood, followed by the most splendid series of pre-meal snacks. The sommelier presented the little book of wine. We left it to his safe hands to recommend wine by glass, starting with a light bodied red from South of France. 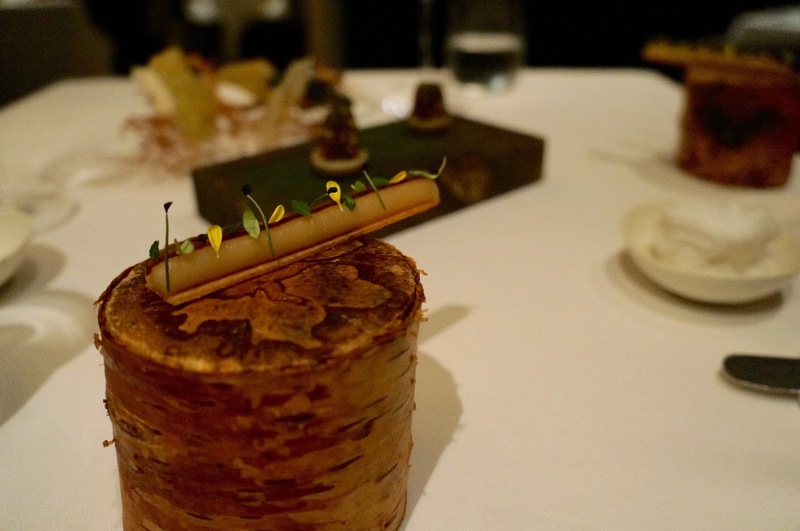 The small pile of ceps masked the mushroom mousse in the centre, served on brittle biscuit, was like a breath of fungi perfume.The beautifully presented air-dried vegetable crisps were innovative and moreish. 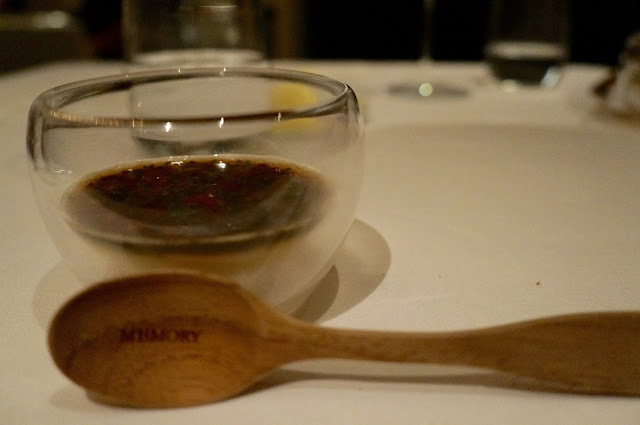 But my favourite was the thin twig of celeriac puree mixed with the umami from miso. This was mind-blowing. 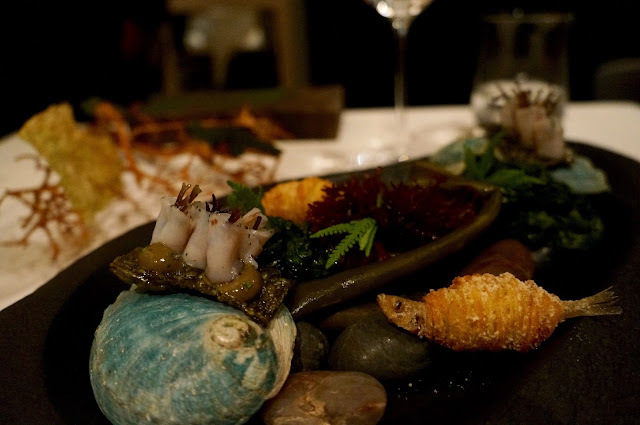 The small bundles of seaweed were blanketed with thin slices of abalone sashimi, naturally sweet and delicate with a springy texture. The flavours were incredibly clean, like a breeze across the ocean. 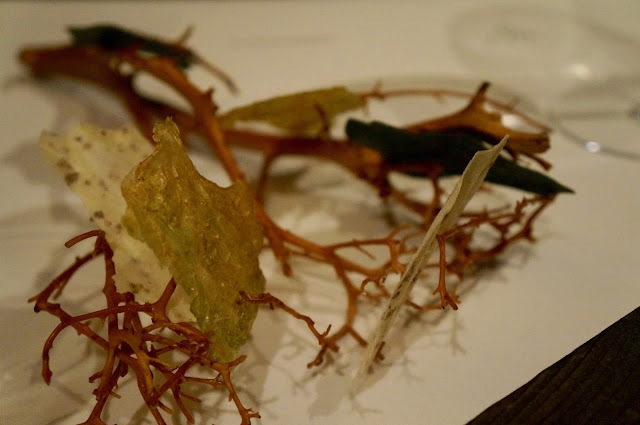 The tongue-in-cheek fish & chips was a tiny white bait wrapped in fluffy potato coils, dusted with cider vinegar. It was a perfect mouthful of the iconic British fare. 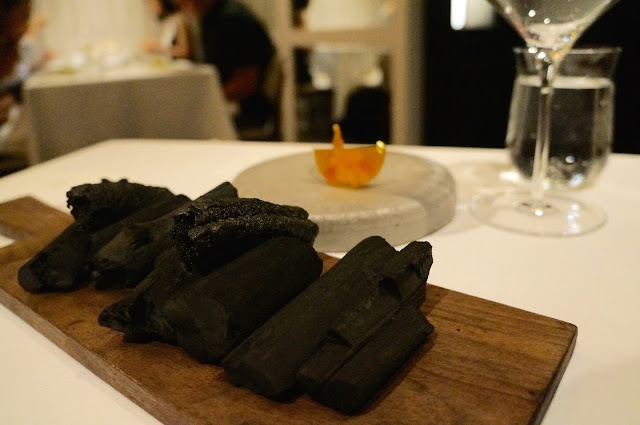 We were given the challenge to pick out the charcoal bread from the real charcoal pieces, served with a creamy pepper dip with slices of Japanese sweet shrimp. 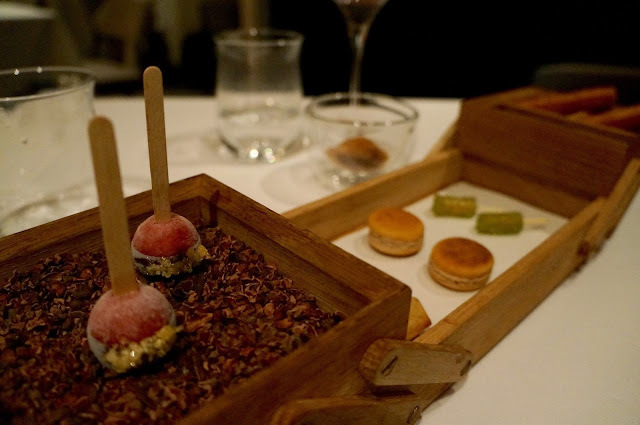 It was a playful end to the series of amuse bouche. Then we move onto the body of our meal, which is a dining concept consisted of 8 keys elements, each representing an interpretation by Chef Andre. 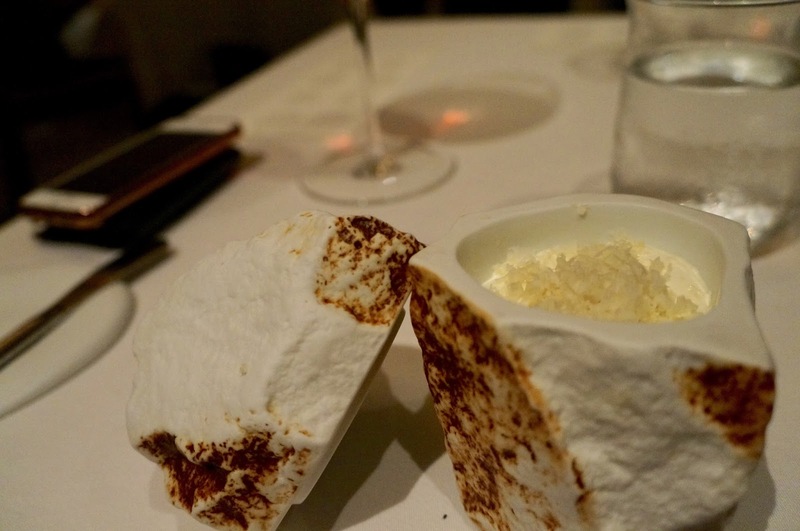 I may well have paired the dishes to the elements incorrectly… I lost track as our server meticulously introduced each course with genuine enthusiasm. Our server explained our first is a mixture of many flavours; sweetness from the corn, bitterness from the almond and spiciness from the horseradish. Never would I have imagined this combination could have so much chemistry. Without losing their characters, the flavours were layered as one took over another, held beautifully together by a savoury whipped vanilla cream. The balance among each ingredient was en pointe. 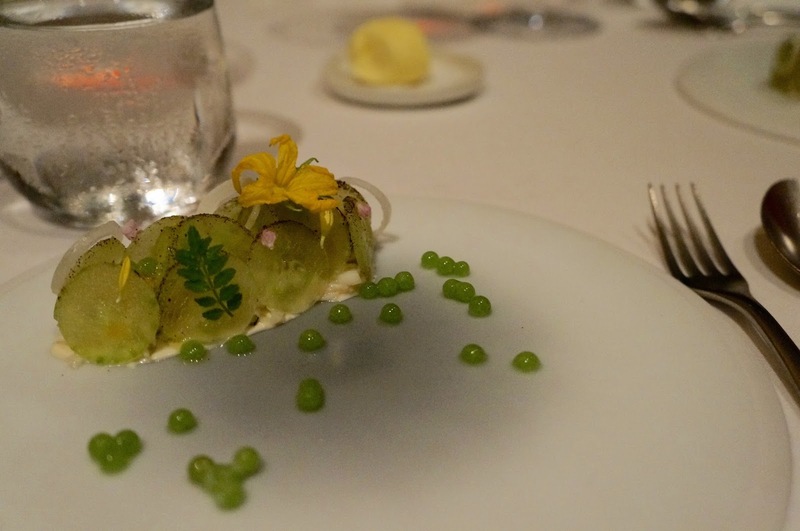 The thin slices of cucumber were lightly marinated with salt water, building a gentle resemblance to the sea, bringing out the sweetness of the crab meat pile in the middle. With sea urchin there is always the risk of it dominating the dish and washing over more subtle components, here the distinctive flavours were craftily toned down by globules of cucumber ice, leaving just a hint of its aroma that lingered in the aftertaste. It was masterly creation. 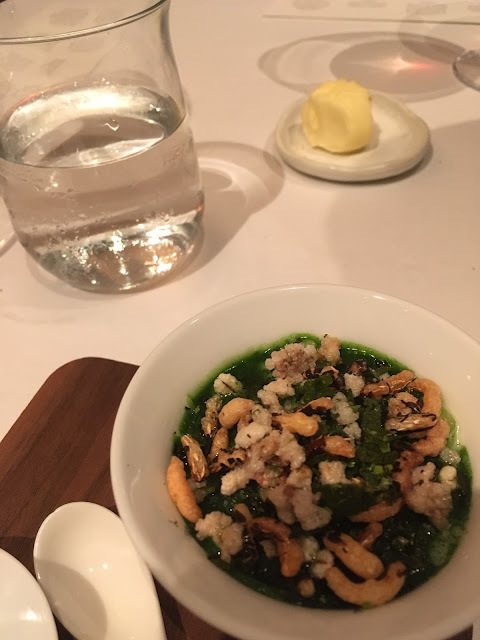 The squid spaghetti were playful and full of bounce, immensed in a luscious velvety potato cream that was mixed with the naturally salty seaweed jus; finished with a helping of toasted rice and sakura prawns amplifying the oceanic goodness from the seaweed gravy. Gorgeous. This course was a reminder of the 9 years Chef spent in South of France, where he enjoyed cooking with abundance of fresh seafoods. For me, this was pure indulgence; A plump gillardeau oyster was lightly charred to give a touch of smokiness to highlight its minerals but retained its creamy textures in the centre. The slight bitterness was perfect with aubergine, reining in the powerful caviar. 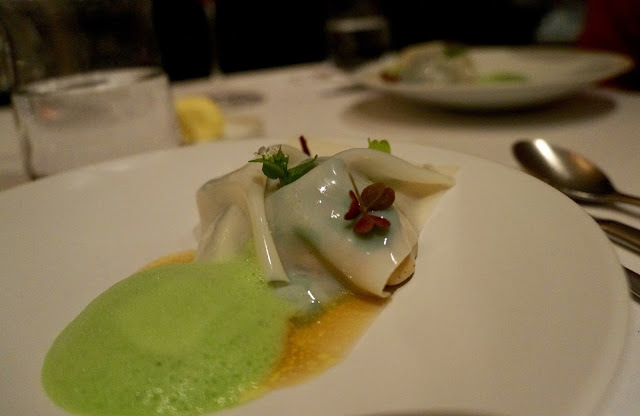 Finally a huge sheet silky scallop carpaccio enveloping the parcel with its exceptional sweetness. Each course was outdoing the previous one… but I think this was my favourite dish of the evening. Topinambour is also known as Jerusalem artichoke. 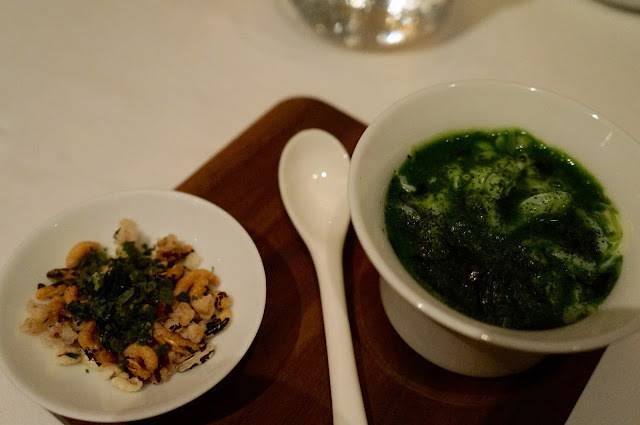 This course was about the soils and so had a strong earthy tone from the soft and succulent artichoke heart, rounded off with a clam broth and springs of dried swordfish. 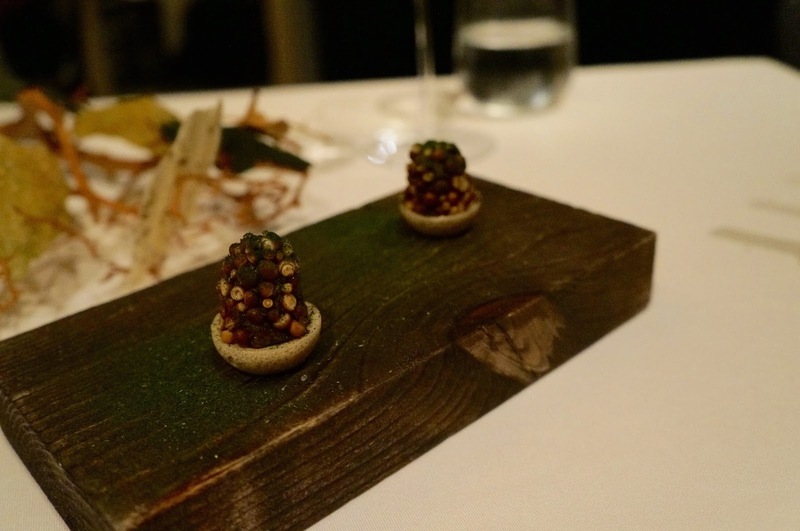 Perhaps I was still too blown away by the oyster, this was somewhat less striking. 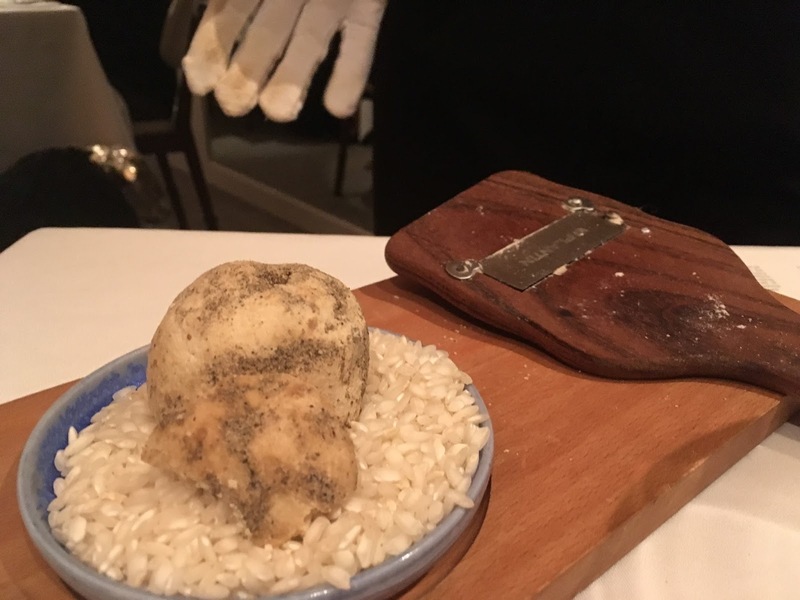 I got excited when this huge fungus arrived at our table and our server asked if we were ready for some white truffle. Then she announced there was neither truffle or risotto in this truffle risotto. The ‘rice’ was pasta, not dissimilar to the puntalette at Lung King Heen, less starchy and more al-dante chew, infused with wild mushroom fragrance from the array of chopped mushroom. 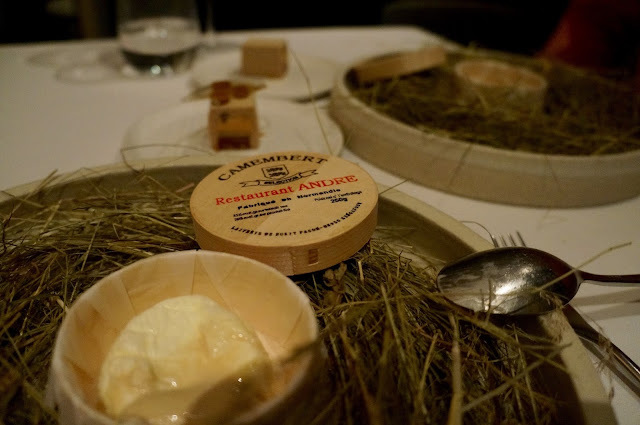 The generous shavings of the pungent cheese was nutty and aromatic, a trusted match to the wild fungus. Apparently Andre has been serving this dish since the restaurant opening. 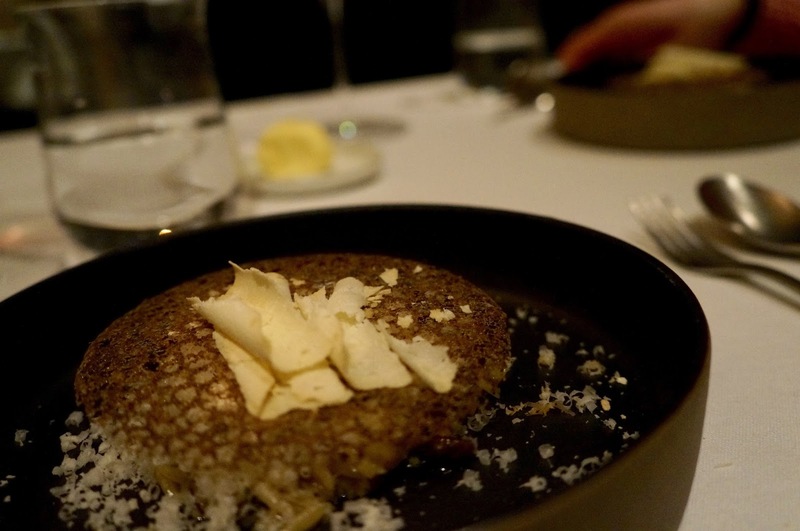 The foie gras was blended into the eggy custard, exuding richness and foie gras essence, topped with a truffle relish. 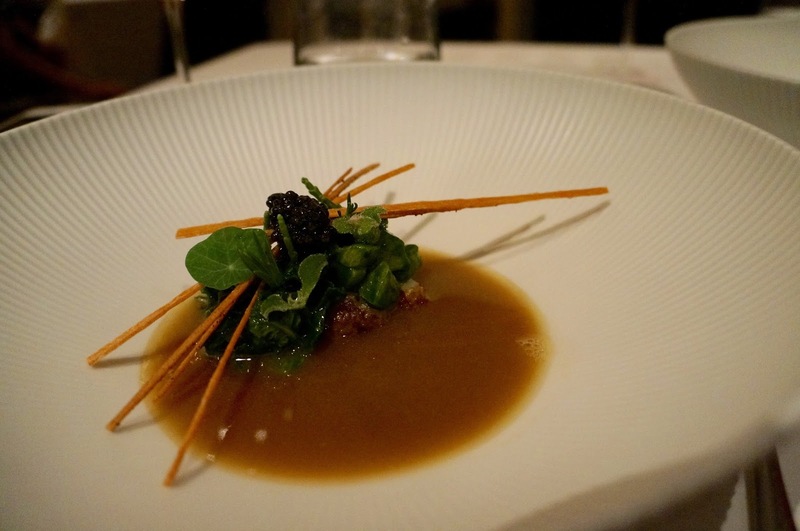 Interestingly we both found the dish familiar, definitely something resonated from my memory. Possibly the egg from Dabbous? 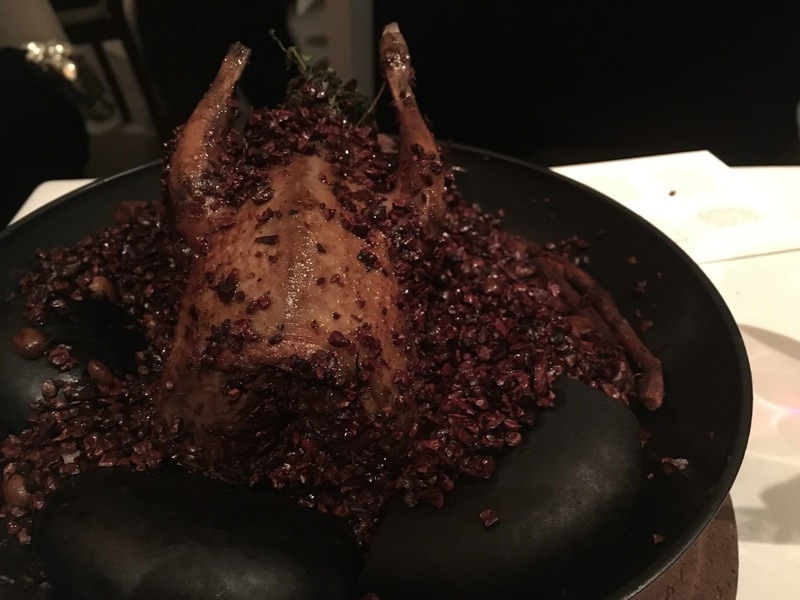 The room as filled with cacao perfume when our server brought out the whole bird. It was then taken back into the kitchen for carving. We both thought, what happened to the rest of the bird?! 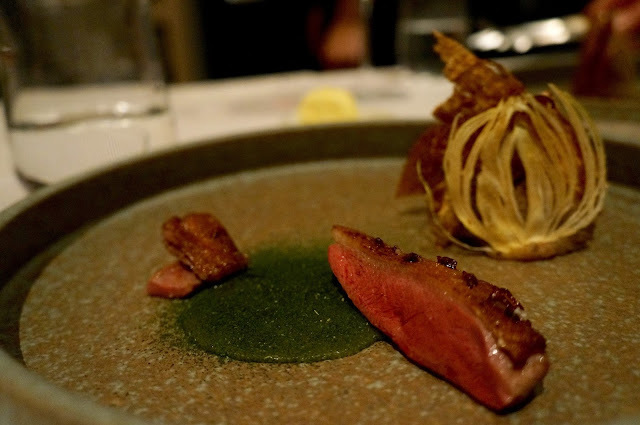 We were served the most tender part of the medium-rare pigeon breast, bursting with gamey flavours but not overpoweringly bloody. The skin had soaked up the woody fragrance, creating a foresty feel with the air-dried vegetables. This was most intriguing. 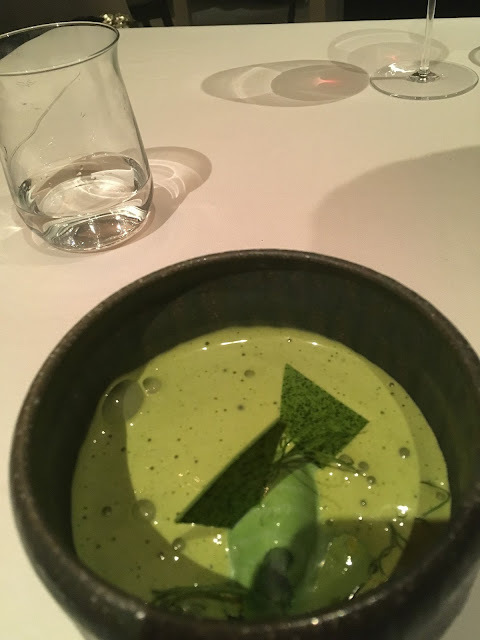 To bridge the transition from savoury to sweet, we were brought a green tea ice cream, overlaid with green pea espuma,and a few frozen peas thrown into the mix. The changeover felt somewhat forced at first, but then it really grew on me and the combination worked. 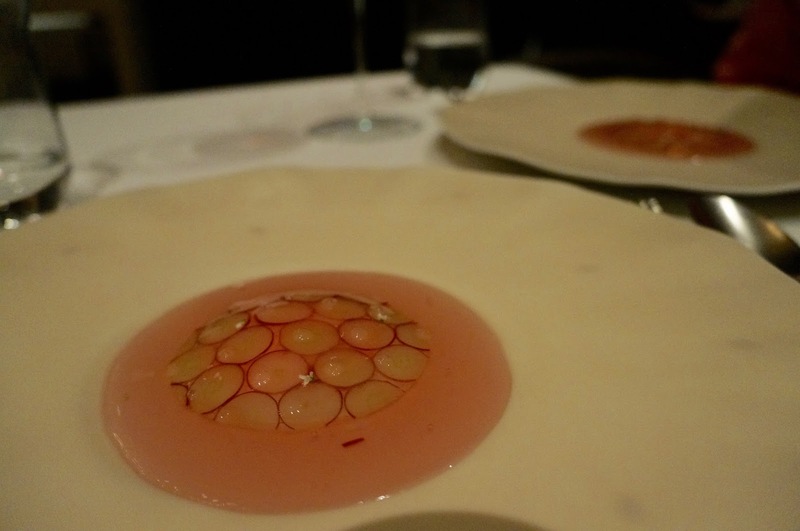 The grape carpaccio looked like sliced octopus. If there was one item that didn’t put an immediate grin on my face this evening, this could be it. It was too sweet; as with a lot of peach flavoured desserts, the sweetness could come across slightly artificial. We thought this was like a melted hi-chew candy. Then the staff brought out my little birthday cake with a music box - salted caramel mousse with a praline filling. Chef even signed a birthday note and wished me a happy birthday as he made his rounds at the end of the evening to greet his guests. This was homemade cheese by Restaurant Andre, it came with a tiny booklet explaining how it was made. The cheese was light and feathery, like a chiffon cheesecake. After sampling the first spoonful, our server added hay ice cream to the soft cheese, building another mouthfeel to the composite. Restaurant Andre was perfection - from start to finish. Every dish was exquisitely designed and magnificently presented; the entire menu was oozing with finesse. 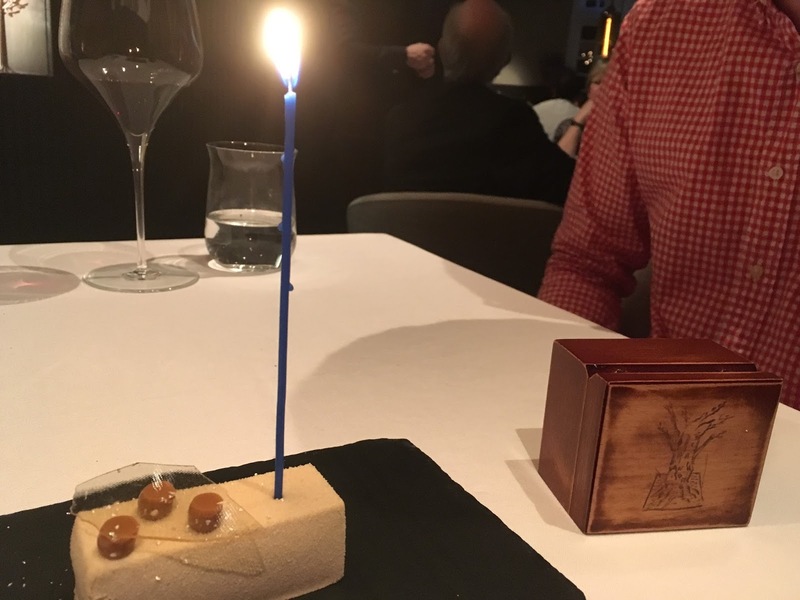 An impeccable evening with the man I’m head over heels for, filled with sensational food, laughters and affection - I could not have asked for a more dreamy birthday.